ACT of Connecticut Nominated for 17 Awards Including Best Equity Theater of the Year, VOTE NOW! 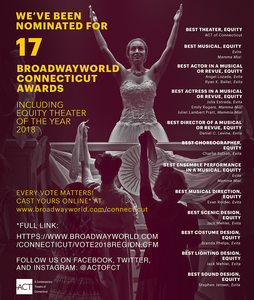 ACT of Connecticut has been nominated for not 1, 2, or 3 BroadwayWorld Connecticut Awards - but 17, including Equity Theater of the Year 2018! Show ACT some LOVE and VOTE now through the end of the month! -Emily Rogers for MAMMA MIA! -Juliet Lambert Pratt for MAMMA MIA! Learn more about ACT of Connecticut here.